I’ve been thinking about dreams this morning and what happens when dreams get big. It reminded me of this post I wrote a few years back. Jeremy continues to write music and has just recorded his first EP. It hasn’t been released yet but I heard the finished songs over the weekend for the first time and they brought this proud mom to tears! Can’t wait for you all to hear them. He can squeeze words out of raw emotion! Natalie also is a singer/song writer and often sings back ground vocals for friends’ albums. I hope she’s scheduled to make the next EP. Boy, can she turn a phrase! Stacey is giving advice and the “wisdom of all things cool” to them all, cheering them on. After she left the Bridges, she got infected by the travel bug. She’s left her foot prints all over Europe and is wondering where to put them next. Also, her dreams are turning to the hot real estate market in Nashville. All of these dreamers coming to America’s music capital need a place to live. Cody married the beautiful Layton Maxwell almost two years ago and he will graduate from Tennessee State this May with a degree in respiratory therapy. He’s thinking of taking on Med school. Talk about big plans! No telling where his plans may take them! Maybe the east coast? I can always keep my fingers crossed. John, my oldest, works in Nashville and is seeking his fortune with diligence. He’s always been a hustler. A bit of hustling and following a dream can make for a very interesting life. Go John! His daughter, Lilyana, delights us with her three year old wit and laughter and the more she talks, I can hear her dreams forming. The house in Alabama on Allendale Road had dreams all over the place. They were piled up in corners, stored under beds, shoved behind the piano, stuffed into dresser drawers and stacked up where no one could see them behind the couch. They sat atop the dining room table like lazy cats claiming their territory and we had to learn to share the space and eat with them as their tails swished across our plates. At night, we had to push them off of our beds to have room to sleep. They would only crawl back up and spoon with us after we had fallen asleep, whispering their plans and suggesting crazy things into our comatose brains while we were most vulnerable. There was no room at all left in the band room. The dreams were squished into drum bowls and guitar bodies. They crouched behind the sound board and hid in the amplifiers. And the microphones; they didn’t fool us a bit. They were long, skinny dreams with a shiny magnet for a head that screamed phrases all the time, like, “I just wanna be heard,” pulling at the iron wills of my children and becoming inseparable. On one side of the room, they were stacked like a cord of dry, fire wood, just waiting their turn to be pulled out from the pile and put in the fire place upstairs, just wanting to burn like nobody’s business. Oh, the laundry room! I could hardly get in there to do a load of dirty clothes because dreams were all over the place. I had to push them out of the way to wash the towels and make room for the mounds of clothes that magically appeared daily before my very eyes. The garage was a mess of dreams. They were hanging from the tool racks and shelves attached to the walls and hung over old bicycles and lawn mowers. There was an old patio table and junk lawn chairs that sat on the top of an old rug and the dreams would sit there and spawn more of themselves and multiply. We didn’t have room to park a car in there! Dreams were constantly knocking on our doors and peeking into our windows, just trying to figure out if they could come in. Our house was bursting at the seams with dreams and there was not room for one more. One day, the dreams decided they were being stifled at our house. The house had become too small for them and they needed a place to stretch out real big and be allowed to grow if they wanted to. They began to consider a place where they could go that would be home to them, a place that they could turn into more than just a thought and a hope. Dreams are like that. They get tired of just being illusive happy thoughts. They have to develop and have substance. With that in their minds, they crawled into my children’s beds as they slept and began whispering their big, fancy plans to my babies. “We need a place to go ,” they sang in their heartbreakingly beautiful Siren voices. “Dreams need more room to roam. Let’s go and find a bigger home.” Who could resist the Siren’s song? And that was that. “Mom, we’ve decided that we are going to move to Nashville. We’ve done all we can do here musically and we need to move to a place where we can network with a music scene that can move us forward. 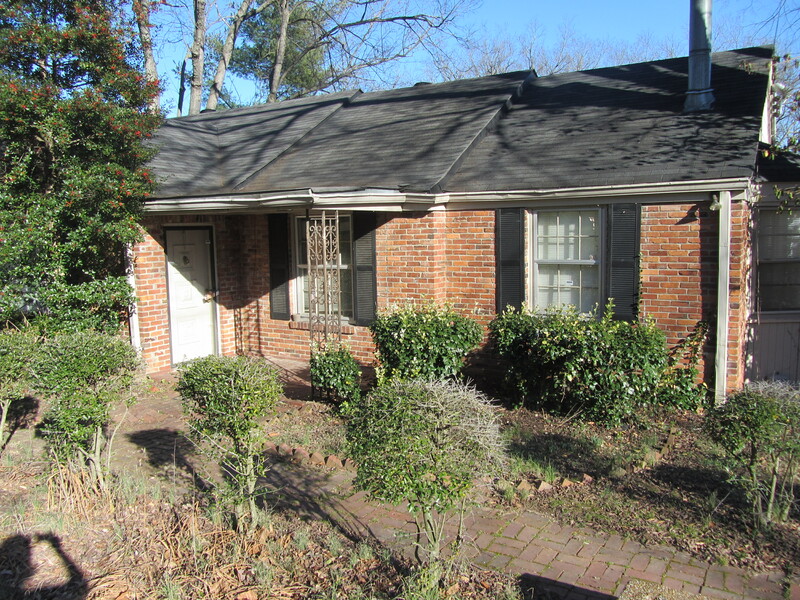 Plus, we’ve found a house we can rent on Sneed Road. We can all live there together.” I was looking at their hopeful faces but all I could see were the dreams talking. They were manifesting and acting just like my children, but I know a dream when I see one. And their voices had the Siren song thing going on. How could I resist? It’s strange when dreams pack up and move out of your house. Sure, the kids left and moved to Nashville, but the absence of living with their dreams was the hardest to get over. All of the hope and promises that cluttered my house left with the kids in the U-Haul truck. Bill and I would have to dedicate the next few years to making our own cluttered mess. 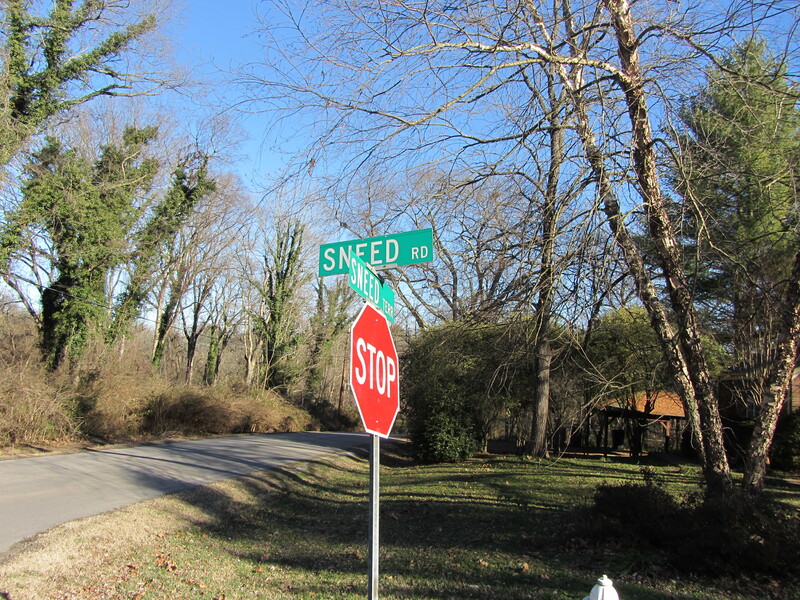 While in Nashville over the holidays, I rode by the house on Sneed Road. The kids had moved out of it after Thanksgiving and it was empty, almost dilapidated looking. The owner had bought it to tear it down and build a Nashville mansion on it for someone whose dreams had propelled them to stardom and success. He was having a hard time selling it in this economy and instead could only rent it to a bunch of hopefuls, my children. I pulled the car over to park in front of the house and just sat there for a while and stared. I gazed at it, my thoughts spilling all over Sneed Road like a bucket of water turned over. I couldn’t collect them and put them back in their holding tank. They were running all over the place. It had been two and a half years since the big dreams had moved to Nashville. 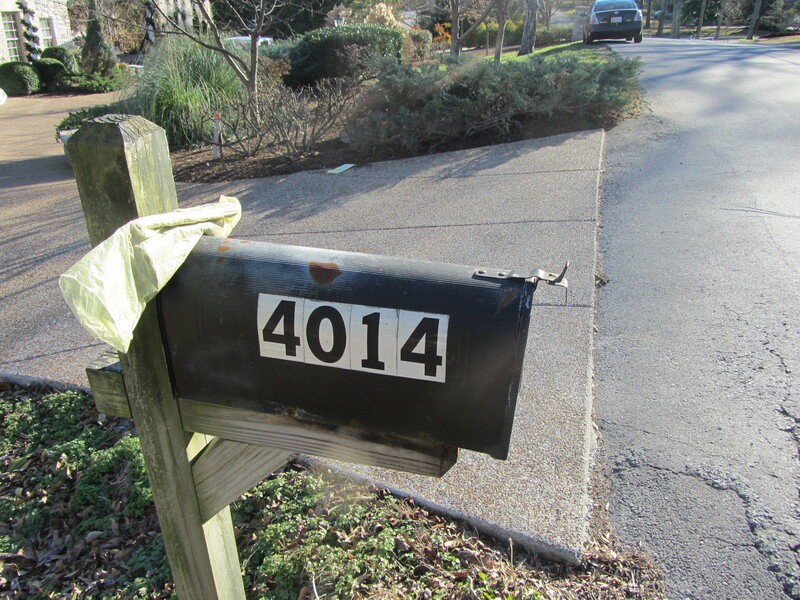 At one time or another, the house on Sneed Road had been a home for all of my children. It was the place their dreams chose to live and I could understand why. I wondered how the house felt now that the dreams had moved out. It took only a few years for the dreams to take over the house, cluttering up the place like a dream junk yard, the neighborhood eye sore. I suppose at some point, the dreams crawled up into bed with each of the kids and whispered dream visions into their deep sleep realms, telling them things like, “This house is too small for all of us. We need to keep the same dream but move into several houses. That way we will have even more room to multiply and divide.” The dreams had become like big, tall, yellow daffodils, growing together on the same small plot of land, rising up thick and strong side by side with not a finger of room left between them. The only way they could continue to bloom and grow was to dig up the plants, tear the roots in half and replant them in different places. Same flower, same dream, just able to grow bigger in many places. I took out my camera, pointed it at my noble but lonely, old friend and took one last picture. After all, these dreams had become mine too. But, I had taken my cluster of daffodils and planted them in the sandy soil of SNEADS Ferry, North Carolina and they were beginning to take root and grow. I know…weird, right? Share this: Thanks for reading! When the groundhog didn’t see his shadow on February 2 in that little town in Pennsylvania, It was broadcast throughout the rest of America that winter would pack its bags early and tiptoe out of here, going out, “as gently as a lamb.” Although I know there’s nothing scientific or logical about the groundhog predicting how long the grip of winter will hold, I secretly rejoiced and believed that old wive’s tale, thinking we had gotten off easily and had enjoyed a mild winter. Afterall, I’d already seen some daffodils shooting up through the ground in my front yard. How could I have been so wrong? Almost since then, winter’s been laughing its hoary head off, throwing one coldfront after another toward us, all coming from the west and joining up with moisture from the south. With them all, I miserably must report, cold, torrential rains have stormed in along with fierce winds that together, have taken their toll on the poor souls of the Topsail Island/Sneads Ferry area. Winter’s new stronghold has dashed my hopes for an early spring and I fear we’re all at its cold hearted mercy. So, what do I do when winter is relentless and I feel as if I live in Alaska instead of a rather mild, southern coastal beach town? I’ll tell you what I do. I wear clothes that feel like pajamas, read spy novels while drinking my Christmas tea from Teavana and I cook hot, steaming meals to chase away the winter blues. I know I’ve never written a cooking blog, but just so you know, I can come up with some amazing dishes when I’m stuck in the house. The heat from the stove, the tat-a-tat of driving rain on the kitchen window and the howling gale blowing in from the ocean make me conjure up strange notions and concoctions. Today I’m a fisherman’s wife from the turn of last century, putting together a chowder in the black kettle over the hot flames in the cottage fireplace. I throw chopped onions, carrots and potatoes into a rich broth saved from some leftover fishbones I saved from breakfast. When they are all tender, I throw in the littleneck clams and put the heavy lid on the pot. After about five minutes, when the clams have had a chance to steam and open, I take off the top and smell the briny goodness. I add a bit of milk to give it a creamy touch and lift the iron pot off the fire, making room for the skillet I use to fry corn cakes. Mmmm…warm chowder and corn cakes. I know Bill will love this supper tonight! I look out the window at the darkening skies, wondering when my husband will get back from the fishing trip. He’s been gone for three days and said he’d be back by sundown today. He didn’t know he would be out on the sea in this storm. I try and calm my worst fear. Ok. Wait a minute. Why am I so dramatic? I’ve let my mind go off on a tangent again! It’s 2016 and I’m no fisherman’s wife. My husband Bill, works at Treasure Realty and I comb the beaches and little towns up and down this southeastern coastline searching for things to write about on the company blog site. Sometimes I wonder what it was really like to eke out a living fishing the brackish New River, the rather shallow Stump Sound and the majestic Atlantic Ocean. The women back in that time had to be physically strong, patient beyond belief and magicians- always creating something glorious from very little! I check my kitchen cabinet. I stocked up for a rainy day last October. I pull out my cans of clams, the bottles of clam juice and check the refrigerator for a carton of Half and Half. As I pull it out I see three fresh ears of corn I bought at Food Lion a few days ago. That settles it! Clam AND corn chowder! The ladies a hundred years ago could have only clam chowder this time of year. Poor dears! Deciding to go by their recipe, I make a few adjustments also. (I’m never afraid to add my own ideas. My cooking motto is: How can it be bad if everything in it’s good?) I get out my cutting board and begin the process of chopping and dicing the vegetables. Feeling like Chef Donna, I use the new knives Bill gave me for Christmas. I only cut myself once! The wind blows the rain up against my window and I can hardly see outside. It howls like a wild animal but my furnace sends out its heat with a steady hum. The house fill up with the smell of onion, celery and carrots sweating it out in the bottom of my soup pot. I turn on my Pandora and Frank Sinatra belts out, “You Make Me Feel So Young.” The smell of the mirepoix blends with the music and my heart does a happy dance. I pour the clam juice into the vegetables and add the potatoes and a few spices. It begins to boil and the steam rises. When the potatoes are tender, I add the clams and fresh corn. I have cut the corn off the cob and I know that the yellow/white kernels will stand out as a burst of crispness to offset the tenderness of the potatoes. The clams will be soft, only a bit chewy and the base of the soup will be creamy with the half and half that’s added at the last. I decide that a little hunk of butter in the pot just to smooth things out a bit would be ever so nice. Who cares about the extra calories when it’s so horrible outside? All the recipes I read say to serve with a loaf of crusty bread but I think back to my vision of the fisherman’s wife. She would have had the corn cakes fried to a crisp. I go to my pantry and get out the cornmeal and remember that buttermilk’s in the refrigerator. Mixing those ingredients together, I whisk in an egg, pouring the mixture into a baking pan that’s been heating up in the oven as a stick of butter melts and fills its bottom. I pour the cornbread mixture in and it sizzles as it hits the pan. This is going to be so good! The cornbread turns a golden brown and I rub the crusty top with more butter. The house smells homey and I hear Bill coming in through the garage. “Boy, can you believe this weather?” he asks as he comes into the kitchen, lifting the lid off the corn and clam chowder. He picks up a spoon to taste and says, “You should see the next street over. It looks like it’s flooding. I had to go down a different road just to get home. I could have used a boat!” I pull some bowls down and begin to set the table. I listen to him chatter about some downed limbs in the yard and I think to myself: “I’m really not so different from the fisherman’s wife. I’m just glad he’s home and we’re safe and warm, about to chow down on some awesome eats!” No wonder they call it “chow”der! If you have some wonderful comfort dishes you’d like to dish up during the cold weather, share your warm up recipes with us! From our house in the ‘Ferry’ to yours, Bon Appetit! I was thirteen years old and my family had taken a day trip to Topsail Beach on Labor Day weekend. My brothers, sister and I had spent the entire day body surfing and riding the waves with our long, plastic, “blow up” floats. The sun was beginning to drop down toward the horizon and I noticed that my mom was shaking the sand out of the beach towels and gathering up the clutter we had created throughout the day. Little piles of shells, coral, smooth stones, sunglasses, sunscreen and magazines littered the old quilt we had spread over the sand to be our “open air” room for the day. “Donna, if you want the shells you collected today, you need to put them in one of these paper cups. Come on and help me get ready to go.” She handed me a Dixie Cup and I scooped my treasures up and put them in my beach bag along with my magazines. I had decided early that morning that I was going to act like a teenager all day. I was going to spend my last day of summer “laying out,” soaking up the last rays of the summer sun, taking a long walk along the shoreline and reading my new “Seventeen” magazine. I didn’t want to go swimming and get in the water above my waist because I would get my hair wet! Today was the day I was going to act my age! It was time to grow up! But the ocean was beautiful. The gentle swells were perfect for body surfing and floating. My siblings were out enjoying the water and I was sweating it out up on the quilt trying to read my magazine. Suddenly, I wanted to be eleven years old again, out in the surf, playing with everybody else. Even Dad was in the water! It wasn’t fair. I changed my mind and decided I didn’t want to be grownup. I could be a teenager next summer. I got up from the quilt and ran toward the water like a little girl, saying, “Wait for me! Where’s an extra float?” I was going to be a kid again, just this one time. We stayed in the water all day. When my mom asked me to help her get ready to go home I packed up my things but looked back longingly at the water. I knew I wouldn’t be back until possibly the next Memorial Day and I had to go back into the ocean one last time, to tell it goodbye. “Mom, I packed up my stuff. I need to go in the water for just a few minutes longer. Please?” Without waiting for her answer I took one of the floats we hadn’t yet deflated and ran toward the water. Saying goodbye to the ocean was something I had done each summer when I was a little girl. I even said my farewells to our town swimming pool when I went on the last day of the summer season. The pool was my fair-weather friend, a friend I spent many hot, lazy summer afternoons with and to not tell it “goodbye” would have been rude…mean. I would swim like a mermaid down near the painted blue bottom and say, “See you next year, old friend,” the bubbles surrounding me filled with the air of sadness. The sound waves bubbled out of my mouth, down to the sandy bottom of the ocean floor. The blessing was released from the dissipating tiny bubbles and it and moved onward, traveling beyond the fishing pier and past the sail boat I saw out in the deep water. Reverberating, it went on next to the shrimp trawler and then on toward the horizon. Everything it touched was blessed; the little fish, the big fish, dolphins swimming after the fish, shells and coral on the ocean floor and odd sea creatures down in the nooks and crannies. The acoustic waves turned into a kind of song, journeying on towards the Gulf Stream where it was picked up and carried north by the strong, warm ocean current, taking up the blessing song to the coast of the eastern United States, then upward to Newfoundland where it joined with other songs sent by children like me. By then, the song was an anthem and moved into the powerful North American Drift only to become a symphony of praise as it rushed toward Western Europe’s shore in a crashing wave of glory on some foreign beach. My thirteen year old girlish mind imagined that this was exactly what happened when someone whispered words of thanksgiving into the sea’s warm, summer waters. I wondered how many children on the receiving end of the European beaches sent “thank you(s)” and “farewells” into their ocean waters at summer’s end and if the swells and waves I played in were carrying symphonic, song waves sent from thankful children on the other side of the Atlantic. A circle of praise? I rose up with the ocean’s swells and my heart was smiling. This moment of peace is brought to you by a gathering of sea birds on Topsail Island. Here’s your song – one of my favorites! I wrote this blog for http://www.treasurerealty.com during the week and wanted to share the magic with you! If you love beach fishing piers, then come and walk the planks with me! There’s something magical about a fishing pier. One of my first memories of the beach was standing on a pier with my grandparents. I believe we stayed in a small motel next to the pier. It was a place that mostly fishermen stayed and it wasn’t at all fancy. I remember we arrived as the sun was setting and after we were settled in the room and had dinner, Grandmother and I walked out onto the pier with Granddaddy. His plan was to find a lucky spot and fish there all night while Grandmother’s and mine was to take a walk to the end of the pier and go back to the air conditioned room to sleep and dream the night away. As I got older, I can remember actually fishing on piers with my dad and brothers. The nearest pier would be one of the first places we’d head to after we had settled into our hotel or beach cottage. As children, we’d put on our shoes to keep from stepping on dreaded fishing hooks and walk with reverence onto the pier. The adults told us to be quiet so we wouldn’t disturb the other fishermen and scare away the fish. I was still fascinated by the cracks between the boards. We would drop small shells through them to see how long they took to hit the water and sometimes, we’d just spit. As kids, the thought of our spit mingling in with the salty water of the ocean made our imaginations go wild as we wondered if our spit would travel across the sea to a foreign shore. To me, it wasn’t about the fishing, it was about being on boards jutting out over the mystical ocean. It’s been ages since I’ve visited a fishing pier but this week, I thought I’d visit the one that is closest to me. This is the summer, after all, that I’m being a tourist in my own “backyard” so I decided that I’d visit the SeaView Fishing Pier on North Topsail Beach. This is the pier that is near my cousin Linda’s beach house and I walk under it every time I walk on the beach. Each time I do, I stop and stare at it’s wooden pilings and “pier” architecture. It’s absolutely stunning to stand underneath it and look out towards the waves breaking on it. Bill and I call it our “Cathedral by the Sea.” It looks like the wooden beams that frame the inside of an old church and we always stop and thank God for allowing us to live near something so beautiful. I had seen the underside of the pier and decided it was high time to visit the top and walk down its planks. When Bill and I pulled up into its parking lot, I realized it was much more than that. There was a two storied building that looked looked like it belonged on the set of a movie based on an iconic east coast fishing village. Plus, there was a two storied little motel next to the pier that was named “The SeaView Fishing Pier Motel.” Why hadn’t I seen it before? It was much like the pier and motel that I had stayed in as a child with my grandparents. Perfect! I looked back over to the pier building.The bottom floor was a bait and tackle shop. We stepped into it first and met Earl, the guy behind the counter. He proudly told us that they sold everything to meet your beach and fishing needs. (You can pay to park there in the summer if you’d like to use their beach access.) As far as fishing needs go, Earl said, “If we don’t have it, you don’t need it.” I looked around and saw that there were many coolers with fresh bait inside (I couldn’t bear looking inside them) and a wall full of lures and tackle. I was impressed with the sign on the wall that boasted of having the largest bloodworms in the state. Who knew? I love employees who take pride in their place of work. Earl was like that. He gave us a bit of the SeaView pier’s history and even showed us pictures from a well-worn book about North Carolina’s fishing piers. The pier was built in 1984 but destroyed in March of 1993 during the “Storm of the Century.” It was rebuilt and opened again in 1999. Greg Ludlum bought it in 2000 and has since been the owner. According to the materials I’ve read, Mr. Ludlum has a passion for piers and it was a life-long dream of his to own one. He knows that many piers are are being destroyed because the land associated with them is worth more money without the pier and can be used for ocean front housing. He hopes to preserve the joy of what it means to fish on a pier. Most people don’t have their own docks or oceanfront places to fish. SeaView Fishing Pier is known for its excellent King Mackerel and bottom fishing. It’s open 24/7 and people seem to be fishing there all the time. We asked Earl if the fish were biting much that week and he said, “Ain’t nothing much biting in this heat. Ever so often people are catching whatever’s out there that will bite Nighttime’s better.” We appreciated his truth and with smiles on our faces, decided to go upstairs to the restaurant for lunch. Now, I have to say, the restaurant wasn’t fancy. After all, it IS a pier restaurant with a slightly “hole in the wall” feel, which to me, is what it should feel like. Sort of like a greasy spoon. They serve breakfast, lunch and dinner and it’s said that they have the best cheese burgers and hot dogs at the beach. Somebody said the chili is what makes them good. We couldn’t believe we’d been in the area for almost five years and had never been there. We ordered cheeseburgers and fries and while we waited, chatted a bit with the cook. He told us that they would fry or cook to your liking any fish you caught and cleaned there. “You catch and clean ‘em and we’ll cook ‘em.” I thought that was a great idea. It made me wish that I was a fisherwoman. I made a mental note: “Buy fishing rods and begin fishing in the fall.” That would give me enough time to read up on fishing skills. The cheeseburgers and fries were absolutely wonderful. They were right. The best on the beach! Next time we wanted a good burger and a beach vibe, we knew where to go! Bill payed for the meal and asked how much it would cost to walk out on the pier. It was $1.00 each and we thought it would be a cheap adventure for two non-fishermen. The pier boasts of being over 1,000 feet long, which is a status that any pier owner or pier aficionado would be proud of. Over 875 feet of planks are actually over the water, making it the longest pier on the North Carolina coast. The afternoon was hot and muggy and I figured the fish were out away from the shore in the deeper water keeping cool. Most of the die hards on the pier seemed half asleep under their umbrellas. Stopping several times to stare out over the water, I looked for sharks, but all I saw were a dozen or so jellyfish bobbing in the sea green waters and one rather large crab, swimming his sideways crabby swim as if he were trying to get away from something bigger than he was. The end of the pier widened into a large deck-like area. There was a round tank there to store live bait and I thought of how every parent with a child on the pier would have to keep them away from its cool luring water. I looked down and noticed that there were still cracks between the planks, some of them big enough to drop small objects through and yes, wide enough to spit through. I looked around and made sure no one was looking and squatted down to spit through the slat, just like a child would do. My spit got carried a little off center by the breeze but it landed a few seconds later into the endless sea. My DNA was mixed with the DNA and makeup of the the present and the ancient past in that water and somehow, that made me feel happy. I also realized then, that piers were really for the child in all of us. We were walking the planks to get that special feeling of being out over the ocean without having to fear the deep waters and the sea monsters that lived in it. We could look down from our high perch and wonder at the sea’s vastness and our little spot above it. It was a delicious feeling and one that seemed to put me and my world in perspective. We walked back slowly down the planks and I decided that the night view would be fabulous and we’d have to take a midnight stroll down the pier one night before it got too cool. I mentioned to Bill that we should take up fishing. I liked the feeling of being on the pier and the owner Mr Ludlum’s, sentiment was right. There’s just something special about about a pier. Maybe Earl could show us some of the rods and reels in the Bait and Tackle Shop. Bill and I were lucky this week. We were invited to stay the week of July fourth with my cousin Linda and her husband, Bake, at their beach house on North Topsail Beach. Several other friends were joining us and it was an offer we couldn’t refuse. Yes, I know that I live only a few miles from their casa (as the crow flies) and I tell everyone I live at the beach, but I don’t live on the majestic ocean’s shore, on the very edge of our continent. Sand and water are not in my backyard or front yard, for that matter. So to actually pack our bags and drag all of our “stuff” over for a few days to stay on our beautiful beach and be “real” vacationers, was a treat for us. After all, didn’t I vow in a former blog post that I was going to be a tourist this summer? Heck yeah! There are somethings that are different about staying on a vacation five minutes from home. First of all, you don’t have to pack too much. I was the ultimate minimalist because I knew that if I ran out of clothing or needed something, I could jump in the car and run home to get it. Secondly, I didn’t have to worry about who would water my tomatoes, peppers, flower gardens and porch plants. I could go home and do that myself. Guess what? I went home every day for a few hours to be a “homie.” I enjoyed checking in at home to do a few chores, only to return back to vacation land. I love arriving at this particular beach house. I know I’m at the ocean because of the smell of salt on the breeze the moment I step out of the car. Taking a deep cleansing breath to rid myself of the real world, I stretch to unwind and shake my shoulders. I believe it’s time to leave my worries down by the elevator door. Pressing a button, I call the elevator down and begin to unload my car. Now, this is where the magic of vacation begins for me. The elevator. Did you ever read C.S. Lewis’ “The Lion, the Witch and the Wardrobe?” It’s the story of four children who are staying at the rural English home of a professor during World War II. The children discover a big old wardrobe in one of the rooms and while playing in it, find that they are transported to Narnia, a snowy, white kingdom ruled by the White Witch. Together with their lion friend Aslan, they conquer the evil witch and rule Narnia. As a child, it was one of my favorite books and I can’t help but think of it every time I press the elevator button. I’m going to step into the magic box and be transported to the enchanted sea kingdom of endless water and sky, sand and surf, sea witches and pirates, mermaids and sea birds, shells and sea glass. The magic portal lifts me up and stops at the second floor. Pulling back the folding partition, I pause before I open the door. I know that it is the only thing standing between me and my land of enchantment. I savor the delicious anticipation and slowly turn the door knob. The beachy smells of the house envelop me like the hug of an old friend. Stepping out and leaving all of my things on the elevator, I turn left, walk a few steps down a little hall and the view hits me: sand, sea and sky, a rather beige, blue and white world where troubles vanish in the wind and waves. I love this kingdom and all of a sudden I have forgotten the outside world! My days are filled with fun, laughter, a lot of beach walking, girl talk, sea glass collecting (I even found a few shards of Indian pottery washed up on the shore,) reading and catching up with some of my favorite people. Of course, for me, planning what to have for dinner is an important part of the day because in this kingdom, Thanksgiving is everyday! What is it about the ocean that makes us all so hungry? After sundown, when the sky and ocean blur into one and everything turns blue-grey outside, we come in and join one another at the big dining room table. I love this table because so many folks can sit around it. Someone has put a Frank Sinatra station on Pandora and the mood is set for the next hour or so. The kitchen island is groaning with dishes we seldom allow ourselves to have except on special occasions; comfort foods and breads with butter and cheese. Wine is poured into generous sized glasses and we fill our plates with gusto. Dinner talk is of dreams and the future, the good memories of the past when our children were little and the cute things our grandchildren are now doing. It’s almost like dinnertime becomes a holy and sacred affair. We talk about the goodness of God. Afterwards, we put on bathing suits and take our wine glasses out to the hot tub, where we spend most of the time looking up into the heavens, pointing out constellations and watching for satellites. In the beach kingdom the night skies never compete with outside lights. Linda tells us of the rare time she and her son saw the Northern Lights over the ocean. We know what a rare thing it is to view them this far south and all of a sudden, we realize again, that we’re in a magical place, a place of miracles. We pause with wonder as our eyes scan the vast universe. The black sky and pearly stars are almost within reaching distance. Heaven feels near and our hearts are full. We come into the air conditioned chill of the beach house. I hurry out of my cold, wet bathing and put on my soft pajamas. The house and it’s inhabitants are settling down to rest. Crawling into bed fully expecting to read a few chapters of my book, I notice Bill is already sleeping. I prop myself up and try to read but it’s like a sea fairy has sprinkled sleeping dust in my eyes. I hear the rhythm of the rising tide and the before I know it, the new day is disrupting my dreams. I sit up from my comfy bed, remembering where I am and I smile. The question of what type of day it is on the other side of the curtains, pulls me out of bed. When I pull them back, light fills the room and I have to adjust my eyes to the sun sparkling off the endless blue water. Walking out onto my balcony I spy a kite dancing in the wind above me. I make an executive decision and adopt it as the flag of my “Magic Beach Kingdom.” I shake my head at my own silliness and look over to the left. I see that one of our neighbors has displayed the American flag on the crossover walkway over the dunes that leads down to the beach. Remembering it’s the week of the Fourth, I stare at it for a while as it snaps with authority in the wind. Reality meets my magical world. I see the pretty kite come ride the breeze and shy away from the Stars and Stripes, dipping towards the ocean. “Oh, please let me wave over your kingdom this week,” it seems to beg. I allow joy to rise in my heart. My worlds have collided and I’m alright with that. Hmmm…Is that coffee I smell? Let the day begin! I went back to my seat, rather embarrassed because no one in that church had every said a cross or harsh word to me. I began thinking about what I had said. So many times, churches are places that “cross words” are either spoken aloud or thought about. People are actually greeted with cross words. Churches should never be a place where angry or hurtful things are said. People want to feel safe in church. They want to be spoken to in a kind and gentle manner. I know that Jesus had some cross words in the temple one time, but it was outside where the money changers (those who exchanged foreign money for ‘temple money’) ripped off the poor people in the exchange and then turned around and overcharged them for the doves they bought for their sacrifice. They were taking double advantage of the poorest of the poor. Jesus’ cross, angry words were for the protection of the poor. He thought the evil men were making the poor suffer more than necessary and in the process, made God look bad to His people. Jesus was the poor people’s advocate that day. I love that church is a place where words should build up, strengthen, encourage and express love. Cross words should be crossed out unless they are used to protect those who are poor and hurting. “Welcome to Cross Words” was a blaring reminder to me that my words should make “Cross Roads” a place of safety and healing for myself and others. The outside world can be scary enough. Let’s keep our churches places of refuge! I thought I’d make up a list of kind words. Along with random acts of kindness, we could add these random words of kindness to our conversations with others. Don’t be surprised if they become magical to those who hear them and the world around them changes forever! If you can think of any words or phrases that were kind and life giving to you, please share them! We could all benefit from your encouragement! Cause if you gots the fever, I’ve gots the remedy. I don’t know….It started a few weeks ago. I’d been fine up until then…But something’s happening to me. I can’t stop staring out the window. It’s like, something’s out there and it’s calling me. Calling my name! And, I’m hearing things. The ground sounds like it’s rumbling. The trees are buzzing with this high pitched energy noise. Birds are singing at night. And my hands…they’re the worst! I want to dig holes in the dirt and feel it’s grittiness under my fingernails and you know how I hate dirty hands! I know it’s crazy but I want to put my nose in the loamy earth and inhale the rich essence of something I can’t quite put my finger on. I don’t know… Life? The essence of life? I’m finding myself watching tutorials on bulb planting and the pros of planting with bare roots. I’m hoarding my money to spend at the dreamiest place ever (Pender Pines Garden Center). Heck, I’ve started walking around Lowes’ garden center like a young girl walking by that new boy’s house, humming to herself while she takes a gander at his bedroom window. But I’m looking at rose bushes! It’s embarrassing. My feet want to break out of the boots I’ve worn since last October and I can’t find my flip flops. The other day, I was sitting on the porch steps in a daze, my eyes closed. The sun felt so good and warm on my face I peeked open an eye to make sure it wasn’t God or an angel pressing against my face. It was only the sun, but that’s just it…when I feel this way, I believe anything can happen! I’m losing my sense of sensibility! I’m getting all dreamy and feeling “spiritual” tingles. I want to lay down on the ground and hug the earth. I need help! I feel like I’m taking crazy pills! That was the moment when “Dr. Bill” took out his “spring tonic” and began to open the bottle. He knew that one spoonful of his remedy would bring my fever down to a controllable level. He’d developed it over the years and it had a powerful affect on me. I am usually too delirious to realize the simplicity of his remedy at my time of need. I gulped it down like a good girl who was promised a fairy tale garden for swallowing the medicine she’d been offered. I waited for his answer and he paused, because he knew he had to say “yes” when he was thinking, “no.” Wisely compromising, he said, “Donna, go out and spend about half that much at first. We’ll worry about the other half later.” My Spring Fever healing had begun. The next day, feeling eighty percent better but in my right mind, I set off to Lowe’s. Since we had bought a house in southeastern North Carolina in Sneads Ferry, on the mainland across from Topsail Island, I had to study up on what types of flowers would grow in our sandy soil and humid “down east,” coastal environment. Going out on a limb and because it was early in the planting season, I bought some summer bulbs and bare root summer flowers. I read that planting your flower garden with bulbs and roots was cheaper plus the flowers would be stronger because of a better root system. Since I was all for saving money and having strong, big plants, I thought I’d give it a try. I saw a sign on the side of the bulb display that said, “Dig, Drop, Done.” Sounded easy enough to me. When I arrived at home, I was full of high hopes and the car was filled with bag after bag of rich garden soil and pretty boxes containing the promise of multitudes of colorful summer blossoms. I put on a new pair of garden gloves and went to work. I began by digging the flower beds and spreading the rich new soil around in them. May I just make a comment here about how hard that was? I had forgotten how much elbow grease it took to dig up a garden. I stood back and admired the pretty, clean beds but was so out of breath and shaky that I decided the next day I would place all of the bulbs and roots where they would be planted in my garden and then I’d just do the “drop” part. The hardest part was over. Nothing like a hard day’s work! The next morning when I awakened, I thought the Spring Fever was back in full force but with new symptoms. My body ached so badly I could hardly get out of bed and it seemed to worsen as the day progressed. There was a cold rain pelting the black soil on my bare garden and I was hoping the dirt wouldn’t wash away. I made a pot of chicken soup and stayed inside all day, cursing my body pains and nursing a sinus headache. I would begin the “Drop” part of my gardening whenever my body said it was OK.
Three days later (count them, one, two three,) my body said I could venture out as much as I felt like it. I took all of my boxes of flower “thingy’s” and went outside to my front porch. I’d decided earlier that I would be like a Victorian gardener and write down all of the flowers I’d planted so that later I could look back in my garden journal and remember what was where. Looking down on my scribbled pages, hoping I was going about it the right way, I thought I’d plant them according to their projected heights. I opened my first package. Liatris and balloon flowers were bulbs. Easy! Just which end of the bulb went on top? Wondering if the bulbs would turn over by themselves if they were planted upside down, I started digging the holes. Hole…water…bulb. Hole…water…bulb. I squatted. I sat flat on the dirt. My back and legs were screaming at me. Grains of dirt squeezed up under my fingernails even though I had on gloves, yet I toiled on. Later, admiring my work, I realized after I had dropped the bulbs in and covered them, the ground still looked the same – bare. The bulbs of promise were several inches below the ground getting a feel for their new home. Bending my ear down toward the soil, I listened. I heard the faint hum of the bulbs, their nervous energy just waiting to start sending roots downward and little shoots upward. And then, Donna, the Down East gardener, smiled and said…”It is good.” I had to take a break to steady my wobbly legs and catch my breath. It was then time to plant the border flowers: purple freckle phlox and dahlias, the bare root plants. I took them out of the package and stared at the plastic bag they came in, moist dirt and roots with some type of nodules hanging on them filled the bag. Gently, I pulled one out and honestly, I couldn’t tell if it was the top or the bottom of the plant. It was so dried and shriveled that I wondered if I should take it back to the store and exchange it for something that looked more “alive.” “Oh well,” I thought, “I’m just going to put it in the ground and cover it up. A flower should know what it’s supposed to do. “Dig. Drop. Done.” Right? I planted all the bare roots, spacing them as I should, praying that I was putting them in right side up. Spreading my hands out over the gardens, I asked God to fix any wrong I might have unknowingly done and bless my garden in spite of itself! Done! I trudged up the porch steps, feeling every groaning muscle in my body. It’s a known fact: If you want something beautiful, you have to work hard for it. Ugh! I was filthy, tired and sore. As I ran some hot bath water, I wondered how much I would have had to plant if Bill had given me all the money I thought I’d needed to plant my flower beds. I crawled into the tub and thanked God that my husband had “been gentle with me” and only let me get half of what I wanted. His tonic for treating “Spring Fever” had healed me from head to toe. Just throw a little money at a project you really want to accomplish and half way through, you’ll lose energy or interest in it. Brilliant! As I begin to clean the dirt from under my fingernails, I wondered if I could come up for a cure for the “March Madness” that seemed to infect him every spring. I was going to have to think on that one! Update: It’s only been four days and already we’ve spotted some of the Asiatic Lilies coming up in one of the beds around our Flowering Plum tree. I guess I planted them right side up after all or God had pity sakes on me! OK little darlings! Here are three of my favorite artists paying tribute to one of one of my all time “greats,” George Harrison. Enjoy your song!